It’s finally here, my 100th pattern! And this is a very special one, as it comes with a story. The Vintage Wobble Afghan is an old, almost lost stitch pattern, rescued and re-interpreted for today! Disclaimer: This post includes affiliate links. Red Heart & Furls provided the materials for this pattern. My Great Aunt Ernestine was 95, and I was staying with her at night, so she could remain in her home. She was an avid crocheter and knitter. In fact, she did all kinds of crafts! Anyway, her arthritis in her hands would not let her work with yarn any longer, and I was bragging about her afghans, and asked if she had the patterns for them. She said ‘Yes!, Right up here!” and pointed to her temple. So, I thought it would be a great way to keep her mind focused, if she could recite the patterns from her head, and walk me thru making them. She did! We made 6 afghans. An Apache Tears, a Navajo afghan, some granny squares, a granny stripe, and of course, this one! This was the second one, with the granny stripe being the first. I was a novice, but she told me every step to take. After the granny squares, I realized she was declining, so I wrote down the patterns for the last two. the Navajo and Apache tears. But, I failed to journal this one….It was wonderful times. I miss her dearly! And this is where I came in! Tami and I both searched and searched, but were unable to find a pattern that looked exacrly like her photo. So taking the bull by the horns, studying the photo and playing with some yarn, I was able to decipher the pattern. Now Tami has generously allowed me to share what Great Aunt Ernestine called her “Wobble Blanket” with all of you! I’m so honored! The original was worked as a scrapghan of sorts – each row in a different color, beautiful in those classic vintage colors. For the one I made, I kept every row a different color, but I worked it up with an ombre effect- my own modern touch. 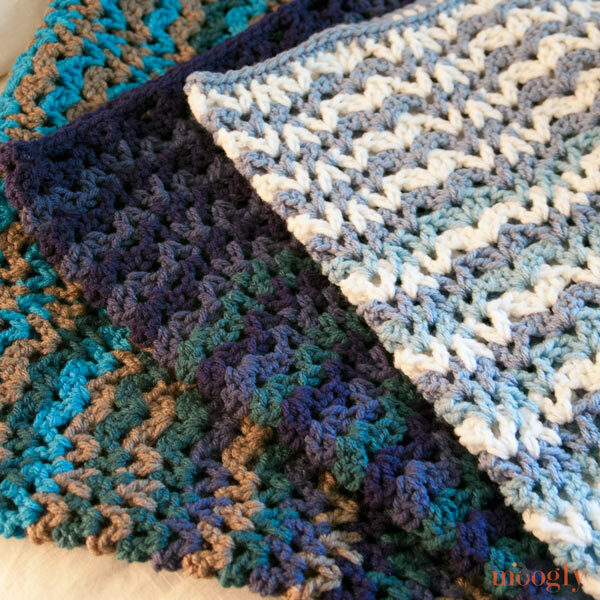 Either way you make it, it’s a wonderful, fun crochet afghan pattern! Note: Each row is worked in a different color. You can use the color striping pattern of your choice, or you can follow along with the ombre pattern I used. To do so, see below the pattern for the color scheme. Want to try it in Tunisian? 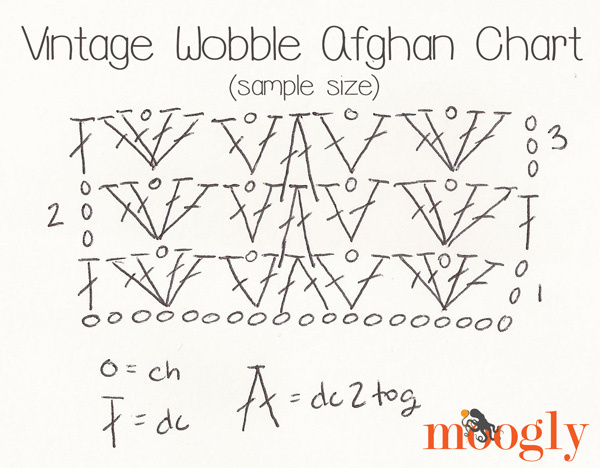 Dela Wilkins has come up with a Tunisian version of the Vintage Wobble pattern! CLICK HERE to check it out! Row 1: Ch 153. Dc in the 6th ch from the hook (skipped chs count as first dc and skip 2). [Dc, ch 1, 2 dc] in the same ch. *Skip 3 ch, [dc, ch 1, dc] in the next ch, dc2tog over the next 3 ch (skip center ch), [dc, ch 1, dc] in the next ch. Skip 3, [2 dc, ch 1, 2 dc] in the next ch. Repeat from * 11 times, until 3 ch remain. Skip 2 ch, dc in the last ch. Break yarn, finish off, and turn. Row 2: With next color, join to first st with a sl st and ch 3 (or use Standing Dc). Skip 2 sts, [2 dc, ch 1, 2 dc] in the ch sp. *Skip 3 sts, [dc, ch 1, dc] in the ch sp, dc2tog in between the posts on either side of the dc2tog of the previous round (see closeup photo below). Skip the next st, [dc, ch 1, dc] in the ch sp. Skip 3 sts, [2 dc, ch 1, 2 dc] in the ch sp. Repeat from * 11 times, until 3 sts remain. Skip 2 sts, dc in the last st (top of the ch 3). Break yarn, finish off, and turn. Rows 3 – 104: Repeat Row 2. Edging: Sc evenly around or use edging pattern desired. I recommend 2 sc around each dc post on the sides of the afghan, but use whatever you think looks best! See the letters above for the colors used – or come up with 8 colors of your own and give each a letter to use this pattern! Start with the darkest color and arrange them in the order desired, and write the letter for each on the label – easy peasy. I recommend you print this part out and cross off each row as you go. You can use the green Print Friendly button at the bottom of this post to print out the whole pattern or just this chart, as needed. Et voila! 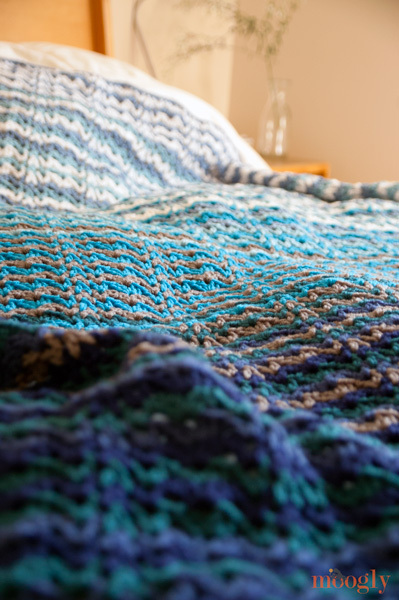 Whether you use the ombre version, your own stripe pattern, or make it as a scrapghan, the Vintage Wobble Afghan is a great pattern, and I’m so happy to be able to share it with you! Many thanks to Tami Lemons and Great Aunt Ernestine as well – it was a wonderful gift to be able to bring this pattern back to life! I also need to thank Red Heart Yarns for giving me the yarn to make this blanket! Love love love that Red Heart With Love! 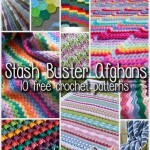 10 Fun and Free Stash Buster Afghan Crochet Patterns! Thank you soooo much! I am so happy that you were able to refresh this 🙂 And I absolutely love the colors you chose! YOU are amazing! I have to thank YOU Tami! Thank you for bringing this to me, and trusting me with sharing it. <3 It is an honor! 🙂 You are a genius! Very Beautiful! I have Van Gogh’s “Starry Night” as my desktop picture right now and this blanket matches -perfectly-! Awesome! What a touching story …love the pattern ..
Congratulations on your 100th designs! Congratulations on your 100th design! It’s beautiful. Thank you for sharing so much. Very Beautiful! And by chance I have Van Gogh’s “Starry Night” as my desktop picture right now and this blanket matches -perfectly-! Awesome! Oh wow, that’s one of my favorite paintings! I’m tickled! WOW! this is a beautiful pattern thank you Tami for allowing Moogly to share with all of us. Amazing, the 100th pattern already! You’re like a crafty machine, hahaha 🙂 This blanket just looks lovely, and such a touching story behind it! What wonderful ladies you all are. From our heart to yours. Our Momma also crochets, she is 92 years young. Thank you for sharing the pattern with us and all of the hard work involved to do this. Thank you for sharing your family with us. I have been looking for a pattern for a blanket for my bed, this is wonderful. You mentioned the Apache and Navajo patterns. Would you be willing to share? I don’t know if they’re the same as Tami’s Great Aunt Ernestine’s patterns, but there are two famous stitch patterns that go by those names. I just recently spotted a Navajo blanket my BIL’s grandmother made, but didn’t know the name – so excited to have discovered what the pattern is! Wow! What a wonderful story and pattern. And it’s #100. That’s double the goodness!! It’s amazing how much our lives are enriched when time, knowledge and most of all, LOVE, is shared. Thanks Tami and Tamara! Beautiful! Reminds me of the Mexican blankets we have down here on the border of Texas/Mexico. Any chance we could talk Tami out of the Navajo and/or Apache tears patterns? I made a Navajo pattern afghan for my step-father, who was Sioux, the last Christmas he was alive. I would love ave to have the pattern again to make another. The Navajo pattern is the very one! And the Apache tears is beautiful! I just showed the detail to my husband and he put in an order for one. Thank you so much! Hi ,Your pattern is really beautiful ,thank you so much . Beautiful afghan! Thank you for sharing story and pattern! Hi Carol! Thank you! To print the pattern for personal use, please use the green Print Friendly button down by the social media buttons at the bottom of the post. What a beautiful story and bringing a vintage pattern back to life is a wonderful way to honor Great Aunt Ernestine. I am sure she would be proud. My question is the skipped chain in the middle of the dc2tog? (I hope that makes sense… first part of the dc2tog in one chain, skip a chain and then complete the second half of the dc2tog in the third chain.) Also, is this stitched into the beginning chain or around the beginning chain? I think I understand it more after looking at the drawing…but I want to be sure before I get too involved and end up having to frog a bunch. Thank you so much for sharing this pattern and the story! I have been looking and looking for something unique yet vintage to do for my Dad for Christmas. It takes me awhile to complete any large project, as I have rheumatoid arthritis, but this one just screamed “Daddy!” to me! Hi Cheryl, sorry for the confusion! Yes, the dc2tog in Row 1 does have the skipped ch in the middle – you’ve got it exactly right. The sts in Row 1 are all worked into the individual chains, not around them. Then, in Row 2 (and beyond), you are working in ch sps and in between the posts, except for the first and last dc sts of the Row (the entire row, not just the repeats). I hope that helps! Let me know if you have any more questions! WOOHOOO!!!! The fog cleared and I got past the first row and am on row 10 now!! I’ve put it on my Ravelry Projects and will upload it there when I finish it! I’m SUPER excited about how it is working up already! BEAUTIFUL PATTERN! Hooray! I’m so glad! I’ll be sure to check it out on the FB page! Gorgeous!! Thanks so much for creating this! Can’t wait to make it!! Hi Rhonda! Those other blankets are a little more well known – here are the patterns! What a lovely pattern (next on my list!) and such a wonderful story to go along with it! Thank you for taking the time to recreate this pattern and then sharing it with the world! Where can I find the Indian patterns afghans? Hi Tamara & Tami, Thank you so much for sharing your touching story and going through the time and effort that I am sure went into figuring it out. I am a self taught newbie crocheter via utube so I am still learning how to read patterns. I have poured over tons of patterns and this one is perfect for the person I want to make it for. My question is row one you have (dc ch 2dc) does that mean 1dc ch 2dc sorry for the silly question but I want to make sure I am doing it correctly. Row one I think is dc in 6th ch from hook skip 2ch then (2dc ch1 2dc) skip 3chs then (dc ch1 dc) nxt ch (dc skip 1 ch dc) then in nxt ch (dc ch1 dc) skip3 (2dc ch1 2dc) then skip 2 (dc) I’m sorry for such a long email I really want this to turn out nice. Thank you for your time and patience. .
Hi Sandra! I’m glad you like the blanket, and congrats on learning to crochet! Row 1 starts with a dc in the 6th chain from the hook. You then work 1 dc, chain 1, and then work 2 dc in that same chain stitch. This puts 2 dc (a chain) and 2 more dc sts in that same chain stitch. *Then you skip 3 chains, and in the next ch you work 1 dc, ch 1, and work 1 more dc in the same ch. Next you work a dc2tog, working the first half of the stitch in the next chain, skip the next chain, and working the second half of the stitch in the ch after that. Then, work 1 dc, ch 1, 1 dc in the next ch. Skip 3 more chains, and work 2 dc in the next ch, ch 1, and work 2 more dc in the same ch. Then start over again at the *. Reading your explanation of dc2tog, you wrote to skip the next ch. I believe you put st in next ch, not skipping one, even your video didn’t show skipping next ch. .? Thanks for your other explanation of the first row! 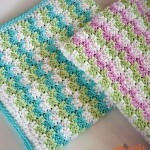 I think I will have to try this pattern, it’s so pretty when done! Hi Tamara, Thank you so much, I think I have got it now. . I will post my progress on my ravelry page..
Glad to help Sandra – you too! Just wanted to thank you for sharing this unique pattern. I will definitely have to make this. Beautiful! Thank you so much for sharing this pattern with us. I am currently on row 64 and am following your color chart. It is gorgeous! You are very talented! I am planning to make a matching mandala in the hoop as well. Thank you again! 😀 Thank you so much Carol! It was such a fun pattern to work on. 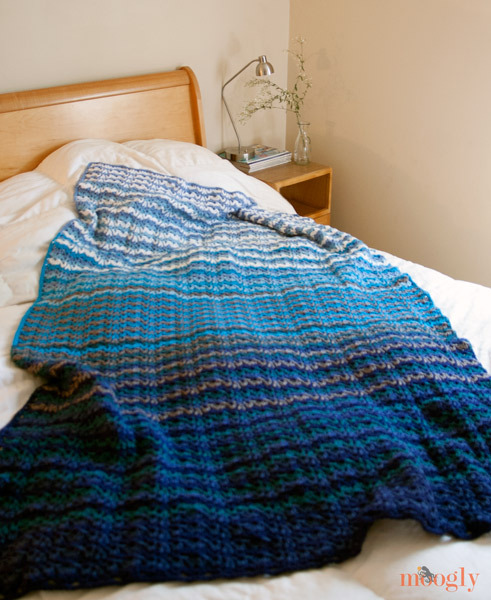 I did some math, and to lengthen the blanket to 80″ you’d want to add about 20 rows. (104 rows = 66″, 19-20 rows = 12″) So rather than reworking the entire ombre order, what I would do, is after every 10 rows of the color pattern, repeat the last two rows. So follow the set pattern for 1-10, then repeat rows 9 and 10 before going to row 11. Then after row 20, repeat rows 19 ad 20 before going on to row 21, etc. This will give you 20 extra rows by the end and will keep the ombre effect going. 🙂 Hope that helps! Thanks so much for this pattern, I have made 2 of these one for each of my grandchildren and my husband is now INSISTING I make one for our king size bed! It’s a brilliant pattern, you never get bored with it because it’s always changing if you do the scrap guan style. my husband loves ours also! the day I finished it and brought it home from Aunt Ern’s house, He has raved about it! My grandbabies love it too. I think it is all of the colors in it! I am so glad you love making them! Aunt Ern would be so proud! I have a question about the changing the size part. I’ve seen this before in some of your patterns, but I don’t understand what all the numbers mean. When you say, “work in a multiple of 12 plus 7, plus 2”: Does the 12 stand for the repeat? What do the 7 and the 2 stand for? Why wouldn’t it say multiple of 12 plus 9? Or a multiple of 19 plus 2? I’m just trying to understand for future reference. Love this pattern! I made an afghan last year and was thinking about a pillow in the same pattern. So I could work it in the round as you state in this reply? I would just have to get it to the right size I guess. Have you done a pillow in this pattern? Hi Lori! I have not, but I think it would look great! 🙂 You could work it in the round, or make two squares/rectangles and sew them together. I loved this pattern and the very sweet story. So, printed out the pattern and did a swatch. It will become and afghan this year, I just loved it. I found the pattern very easy to read and the chart helped tremendously. I showed my swatch to the husband and he said it wasn’t even! I said it is a wobbly afghan design. He loved it, only hoped I didn’t choose the same colors as I used on the swatch. Thanks for the pattern. Thank you for this wonderful pattern! I just finished it using chocolate, medium brown, black, silver and cream. I love the pattern! 😀 Thank you Kelly, I’m so glad! 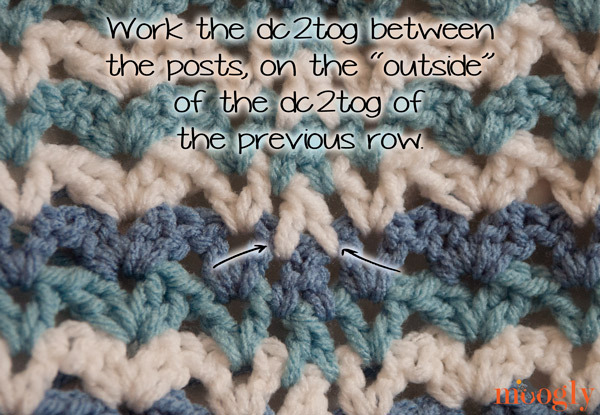 I am just starting to crochet ,could you tell me what a dc2tog is? I have been teaching myself from the patterns on the labels a And I never have seen this before. This is exactly what ive been looking for. My grannie taught me how to crochet and sbe talked me through this pattern…and i could only use her scraps…i loved making it…i didnt crochet for years, and of course shes been gone 15 years….so ive picked back up on the basics.. afghans for my children, and now my grandchildren….but i couldnt remember this one…like there was a block….until just now. Reading this pattern was a beautiful trip down memory lane…it was almost like i could hear her saying everything i read…..thank you both for finding this…. Oh my gosh! Oh Angela, that makes me so happy. <3 Thank you for sharing that. Love the pattern. Thinking I will make it my next project. It wil probably be a wedding present for my brother. I want to make this out of Bernat Cottonish yarn. I like the feel of it better than the 100% acrylic. I am a little worried though because the yarn isn’t as heavy so the size might be smaller. Should I make the starting chain longer? Do I still use a size J hook? Thanks for any help. Thank you! I would use a smaller hook – the Cottonih is significantly thinner. You may wish to make the chain longer, for sure. Thank you. I am using a size H hook. I did make the starting chain longer but I seem to have done something wrong. I chained 153 + 12 +7 +2 but I think I am ending on the wrong cluster of v stitches. I end with the longer one but row 2 seems to start with directions that would go with the smaller one (2dc, ch 1, 2dc). I don’t guess it will matter as long as I adjust row 2? Will it look strange? Just finished my Wobbly Afghan and although it’ll never look like yours, I’m quitelease. I am now going to work on the border. I saw on a previous post that you advise on 2 sc on each dc post on the sides, but how about the top and bottom? It has a sort of wavy look and I’d love to keep it. Thank you again for sharing such a lovely and fun pattern…. Thank you Carmen, I’m so glad you like it! At the top and bottom I just worked one sc in each stitch, but you can play with the stitches and get the look you like! This is such a beautiful pattern! Congratulations to you both. I have recently started crocheting a baby blanket, but I’m not too happy with the results so far, that’s why I was searching for inspiration to start again. I think I have just found it! But I’ll need some advice, please: I don’t want the blanket to be more than 50” long, and I have just 5 different shades. How would I go about recalculating the number of rows to maintain the ombre effect? Thanks again for your suggestions, and for sharing such a special treat! Just finished this throw for my dad. Came out gorgeous but what a lot of ends. Will do something with solid colour next! Thanks Tamara! It is indeed a lot of ends! I save mine for movie night lol. I feel your pain re all the ends! But I just loved the looks of this afghan and felt it was SO worthwhile. One thing that really helped was Tamara’s suggestion to do 10 rows of weave Ins at a time as you go along. This made it manageable. Thanks again for designing such a gorgeous afghan! 😀 I’m so glad you liked it Carol! I know some people love weaving in ends – I try to look at it as meditation lol. I love this pattern. Thank you for sharing it with everyone. I posted my finished lap blanket on my Ravelry page. I used a vintage blue wool, and it is lovely. Can’t wait to make one in baby yarns. I love the stories almost as much as the patterns!! Please, keep putting stories with any and every pattern you post. I keep the stories with the patterns so I can read them each time I crochet the patterns. Thank you for all that you are doing for us. <3 Thank you so much Sharon! Hi, this is a beautiful pattern! I was wondering if I wanted to do this all in the same color and not break the yarn, would I just chain 2 for each new row? Thanks for sharing the pattern! Thank you for the quick response! I will give the chainless starting dc a try. My thought is this pattern would make a great shawl or lap blanket too. My friends and I make lapghans for nursing homes. My mom is in one now and won’t be coming home. She would love another creation as well as her roommate who is severely mentally handicapped. This nursing home is the best so far as my mom has been in two others previously. I’ve been away from crocheting for awhile because of working and now being POA for both parents and dealing with all the paperwork etc. This is what I need to take care of me also! Thank you again for all the patterns and great videos, and sharing your talents. One more thing…my late grandmother was a very talented crocheter and I wish I would have let her teach me years ago. The afghans she made for me over 30 years ago still look new and I use them every day. <3 Thank you Pamela! I’m glad your mother is in a better home now – I know that tough decisions like that are in my own future someday. I’m so glad you’ve been able to find some comfort in crochet! It gets so many of us through hard times. Hi congratulations on your 100th pattern! I love your work and your tutorials. I’m looking help. I’ve probably already asked at some stage but I’m now getting desperate. I’m in hospital now for 9 weeks and my mum is agreeing to everybody that asks her that I’ll crochet whatever they want and on top of this because they’re her friends she’s saying I’ll do it for free! So now so far on my latest count I’ve 26 afghans/blankets to crochet and no patterns and they all have to be different patterns. Some are for babies some for children eg a 6 yr old girl and a 10 yr old boy and some for adults and elderly. I’m new to crocheting and I lost my job due to ill health in january this year and am waiting on my ill health pension coming through. 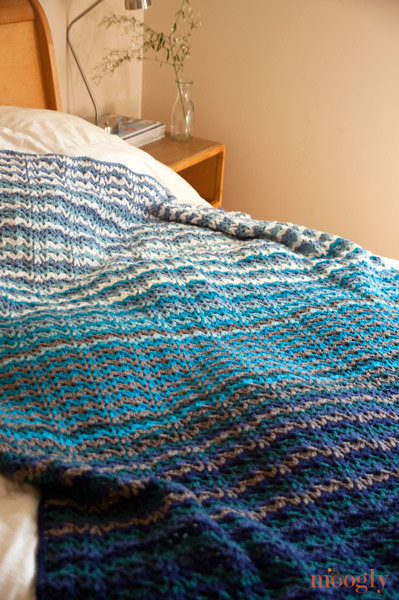 I recently bought £200 worth of yarn to get started on these blankets and had my 15 crochet books and all my hooks and Tunisian hooks etc brought in to hospital to start these blankets and not even getting to look at the yarn I’d bought which I bought from savings and was relying on the people to pay for their own yarn used everything was taken…stolen!!! My lifes worth of crocheting stuff gone (well I’d only started but because I was enthusiastic and had an income then I bought everything I wanted and needed including ergonomic crochet hooks as I’ve multiple disabilities and cannot use hands properly without being in a lot of pain). I’ve had to accept that these are gone and that the books were a luxury that I’ll never be able to afford again as were the ergonomic crochet hooks so I’ll have to deal with not being able to crochet for long periods. Anyway sorry for moaning but I’m still in hospital and everyone’s putting pressure on me to get these blankets finished but I’ve no patterns and don’t know what sites offers free patterns. I see 2 other names for blankets inthis post one was nevajo or something and I cant remember the other. Do you have patterns for them or what patterns do you have for any throws/afghans/blankets/samplers/motifs etc? I’m in hospital where there’s no wifi so I’m relying in what data I have in my phone to keep me on facebook and youtube etc. If you even know of any youtube tutorials for blankets. Any help would be much appreciated. You can email me on address above or pm me on facebook. Please pass this on to as many of your crocheting friends/colleagues as you can and share my email. Please note I’m by no way asking for stuff by telling you about mine being stolen I’m just drawing you a picture of what my life is like and the importance of getting these patterns although I don’t know how I’m going to replace the hooks and yarn. If you know of anyone selling second hand ergonomic hooks let me know although it probably wld cost more to post to northern Ireland than for the hooks themselves. 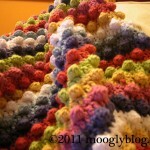 I love your wiggle stitch but am aware you cant make a blanket out of it. Do you have a nice modern v stitch pattern? Will you be bringing out more blanket patterns and video tutorials? I would love to see another sampler like the one the crochet crowd did with the different squares. I’d also love to try the c2c blanket but I can’t grasp the concept of it and I’m partially sighted so it’s harder for me to follow youtube videos that don’t have subtitles. I hope things start looking up for you soon! I’m looking forward to making this! I have two adult boys who want me to make them a Georgia Bulldog blanket so rather than switch colors I can get the teams colors in a multicolor yarn. I can’t wait to see how it comes out! I like patterns that have easy to understand instructions! Thanks again! 😀 Thank you so much Debbie! I hope they like them – and appreciate all you do for them! I love this pattern but I love the story behind it even more! I can’t wait to make this for my Aunt and she will love the history behind the pattern. I know she will think of Great Aunt Ernestine and me whenever she uses it! Tami, thank you so much for sharing this! 🙂 Thank you so much Brooke! Hello. I came across this pattern and this story and first I want to say thank you so much for sharing this pattern for everyone to make. That is amazing for you to do this. I have almost completed this blanket. It is turning out to be amazing. Also, I wanted to say what an amazing person you are for taking care of your aunt the way you did. I wanted to ask your permission for me to write this pattern in my crochet notebook. As I don’t have a printer to print items from online I handwrite all my patterns that I find and really enjoy in a notebook. I know sometimes when things are printed it does the copyright of who the pattern belongs to and if I handwrite it will not have that, so I just wanted to get your permission first. Thank you in advance. Hi Beth, and thank you! Though the story is not mine. 🙂 But you can write it down for personal use, sure! It’s just sharing that is an issue, but whatever you like to do for personal use is fine. Thanks for this pattern! I made one for a Xmas present and it turned out great, plus it was fun to make. I plan to do another one in purple for myself. I’m looking for a pattern called a “crazy stitch”. It looks like double crochets leaning sideways. Any ideas where I can find the pattern? I’d really appreciate any ones help. I was wondering if you have tried this with 4 colors? Or 4 colors plus white? My nephew is big on the primary colors of blue, red, orange, and yellow. I want to make this for him but I’m unsure how to make it unique and not just striping the 4 colors. I’m planning to use Caron Simply Soft in Royal Blue, Harvest Red, Neon Orange, and Super Duper Yellow. I don’t know, maybe I should use white too? Please help! Any suggestions would be most welcome. Tamara Kelly thank you so much for your reply! 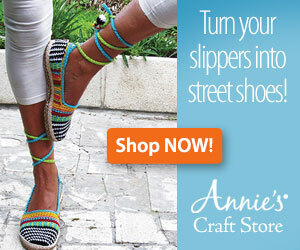 I love this website that you provided the link too and am looking forward to my yarn shipment to arrive so I can begin. Thanks again so much! What a wonderful story about working with your grandmother and writing down the patterns that she had in her head. Very touching. Hi Debra! 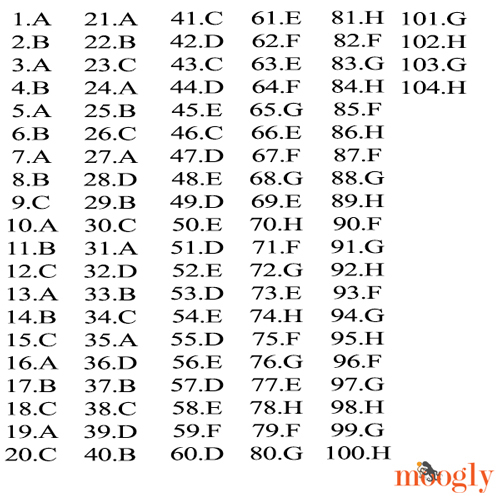 Assuming the gauge is the same, you’d ch 117 for a 36″ blanket. It’s a multiple of 12, plus 7 more, then plus 2 for the starting chain. So 12*9=108, plus 7=115, plus 2=117. I know it’s been over two years since you published this pattern, but I’m a little late to the party. I’m off to buy the yarn for this right now and I’m so excited! I’ve been drooling over this pattern for months! Hi Tamara! Thanks for this beautiful pattern and for your entire site. I have made several of your patterns and love the results! I’ll have to send you some pics. I have been wanting to make this one for awhile and I finally collected all the colors of Red Heart with Love you used and just realized that some of my skeins are only 318 yds while others are 370. I’m not going to have enough to finish, am I? Do you have any suggestions on how to adjust the pattern slightly to work with what I’ve got? Why would the same yarn be sold in these slightly different yardages? I can’t figure it out and even the Red Heart website describes it as 370 yds. I’m so confused! Hi again. I was able to locate the colors i need in the larger skeins at my local JoAnn’s so I don’t need to make any adjustments after all. The smaller skeins were all purchased at Walmart. I guess that’s the difference although I still don’t understand. Thanks again, I can’t wait to get started! I’m glad you were able to find the larger skeins! Walmart has a way of making manufacturers make unique sizes and skus of products, to avoid price matching. That’s my best guess anyway. Thanks for a great pattern and what a wonderful story behind it. I am about to make a double bed blanket for my nephew as he graduates becoming a doctor. He lives in Adelaide and it gets really cold down there so I know he will love it. I’m hoping to use the random stripe generator to work out the ombre using less than 8 colours – otherwise I will resort to excel. Thanks again for the great patterns that you post – I have used a couple of them in baby blankets that I made for the special care nursery at our local hospital – I have been told that parents really appreciate getting a home made baby blanket to take home with them – I just wish I didn’t have to work and could make more !!!! 😀 Thank you so much Linda!! I loved reading your comment! Thank you! I love the afghan and love the story even more! I also had a Great Aunt Ernestine who went by the name Annie. A delight and so talented. She kept all her “recipes” up there – both yarn and food. She was always happy to share and all her talents will live with us forever! <3 I’m so glaed you like it Cyndie! I have enjoyed reading all of the positive comments about my Aunt Ernestine! Her birthday was just a few days ago, and what a wonderful way to look back, and see how much she helped others, even after her passing. I still miss her every day, but I know she is with Her soulmate, and dancing in heaven. She still continues to lift me up, when I need it the most. I, sometimes, get frustrated with a project, or life in general, and her voice rings in my head….”take it step by step, and it will never overwhelm you” . Blessings to you all, and thank you again, for helping her live on! Oh good! I’m glad to hear it, thank you Tami! best looking scrap afghans you can make. Thank you for sharing. 😀 Thank you so much Joyce! Beautiful! I must make one. Thnx a bunch, God’s blessings upon you. ♥ Thank you so much Millie! Howdy there… Your photo shows a tan or taupe type color mixed in, and I really like that… but it is not listed on your color list. What color is that, and what letter would it correspond to on the ombre color order list you have? I was thinking maybe D or E? I really like what you have in the photo and would like to mimic it exactly. Thanks! I believe that is the grey pewter (D) – it does have a tan look in the photos for some odd reason! I thought the same thing when I first found this pattern and wanted a tan color in there, too. I substituted Red Heart with Love in Tan for the Pewter and Aran for the White to make the final blanket a little “warmer” in color. It’s still a work in progress but I really like all the colors together with my substitutions. I hope that helps! Hi Penny! That is a mystery to me I’m afraid. I don’t know why that would happen! I see this pattern says it is EASY, my question is, would this be easy for a beginner? Love the pattern, but I am concerned that the beginner may be overwhelmed. Your thoughts would be appreciated. piece to see if your work looks like the picture Moogly has provided. That is the best way to not be disappointed in the pattern. 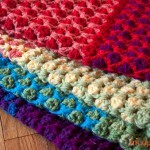 I’m sure you will like it and, if you are like me, you will make many afghans using this pattern. Great for using up scraps as well. Tamara I just finished my last row on the Wobble Afghan and am ready to start the edging. I used the same colors you used. Can you tell me what color you used for the edging? Did you use more than one color and if so which ones where? And did you use the SC clear around it? And how many sts did you use for the corners? Thanks so much for your help. This afghan turned out beautiful. Thank you, what a wonderful joint project! Thought you’d be interested know that I found the same pattern on a Russian website last year. I’m not sure which one as I don’t speak Russian … it was made in much lighter cotton as a tablecloth. It could be one of those patterns that has gone around the world through the 19th century emigrés and been adapted to suit circumstances. There are many. Love this pattern. Would love to see the other afghans too, they sound amazing!